Uzeboxx is a port of the Cuzebox emulator for Xbox (Cuzebox was originally developed by Sandor Zsuga "Jubatian"). 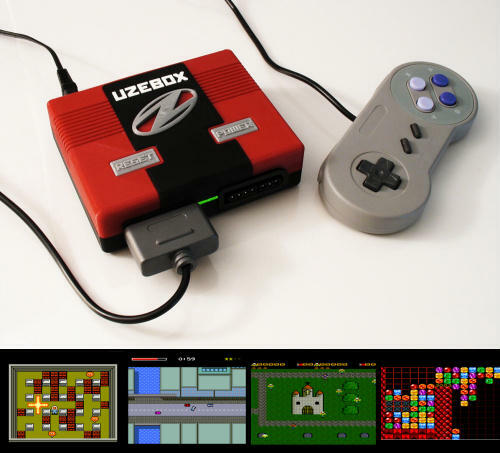 It is an emulator of the Uzebox console: a retro-minimalist open source game console based on Atmel's ATmega644 microcontroller. The main goal of the Uzebox console is encouraging homebrew development, so in its catalog you can find lots of original projects. Besides, there is a lot of activity in its forums. Many of its homebrew games show a lot of creativity, so it is a very interesting machine to have emulated in the black box! The emulator currently runs at around 80% of full speed, so games are totally playable (although they still need some small optimizations). If there is interest, I will keep working on this project.